Don't judge a Prince by his clothing in this fairy tale. Students become engaged in the novel by discussing the reactions of its characters. Identify the vowel sounds from vocabulary words found in the story. Correct a set of sentences with their missing capital letters. Identify statements from the book as true or false. Students put themselves in Elizabeth's shoes and decide what they would have done to outwit the dragon. As a newspaper reporter, think of five questions to ask Princess Elizabeth and Prince Ronald about their ordeal with the dragon. Come up with things to change about the story, things not to change, and things to add with a Story Makeover graphic organizer. Aligned to your State Standards and written to Bloom's Taxonomy, additional crossword, word search, comprehension quiz and answer key are also included. This is the story of Princess Elizabeth, who is in love with Prince Ronald. They plan to soon marry. 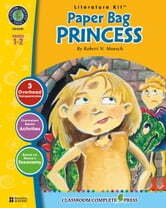 One day, a terrible dragon smashes Elizabeth’s castle, burns her clothes and disappears with her Prince Ronald. Everything is burnt, so she wears a paper bag and sets off to go get him. She outwits the dragon by challenging him. Exhausted by all the activity, the dragon falls fast asleep. 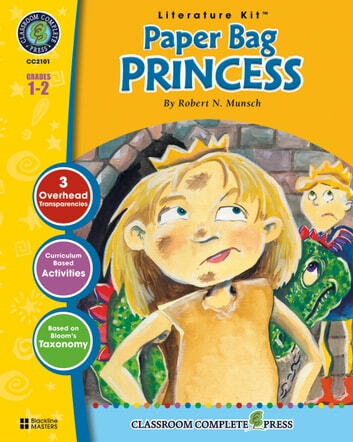 Elizabeth steps over the dragon, goes into the cave and rescues Prince Ronald. Astonished by his reaction, she tells him his clothes are pretty and his hair is tidy, but in fact he’s a bum. They don’t get married after all.